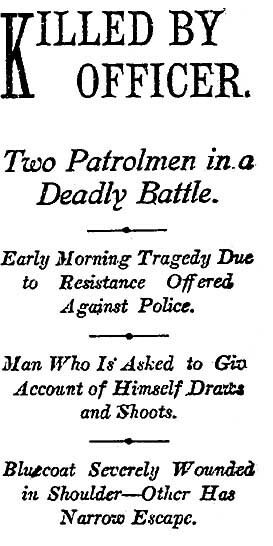 About 1 a.m. on a dark corner at East Adams and South San Pedro, the hard, shabby life of William Ross ended when he said, â€œWhat in hell are you fellows up to?,â€ drew a pistol and shot plainclothes Officer C.A. May. May and his partner, J.M. Hoover, were walking east on Adams when they encountered Ross, described as a â€œrather roughly dressed man.â€ Earlier in the evening, Hoover and May, who were working plainclothes as part of a crackdown on burglaries in the area, investigated an incident at 223 E. Jefferson Blvd., where L.C. Kelker had reported that two men were on his front porch. The officers warned the two men to leave, but did not arrest them as there appeared to be no criminal intent, The Times says. One of the men started into the house, threatening to get a gun and â€œdoâ€ the officers, but May and Hoover left without taking any action. Ross said: â€œWhat in hell are you fellows up to? My name is Ross and I live just around the corner.â€ Then he stepped back, drew a pistol and shot May in the shoulder or the chest. He fired at Hoover, who ducked and shot Ross in the forehead. Police found some papers on Rossâ€™ body, a little money and newspaper clippings from the Herald, one about a suicide attempt by Mrs. Mary Ross of 383 or 583 Central Ave. over domestic problems and a legal notice of Mrs. Mary Ross suing William Ross for divorce. May was taken to Clara Barton Hospital, where he initially showed progress, although doctors were unable to locate the bullet. Investigators eventually found Rossâ€™ room at the Good Samaritan Mission, a homeless shelter at Ord Street and San Fernando near the Plaza, but there were no stolen items or any other evidence that he had been committing burglaries. Police also learned that he had been employed at one time at Pacific Carriage Works, 122 S. San Pedro. May was sent home to 2139Â½ S. Los Angeles St. to recover, but the wound became infected and he returned to the hospital. 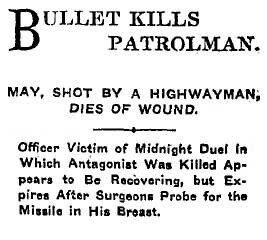 Doctors were unable to locate the bullet and May died Feb. 28, 1907, with his wife and two brothers at his side. As a National Guard member and a veteran who had served in the Philippines during the Spanish-American War, May was given military honors in a funeral at Pierce Bros. Mortuary at Flower and 8th Street. A funeral procession consisting of police officers and National Guard troops escorted his casket to 1st Street and Spring, where they boarded streetcars for the interment at Evergreen Cemetery.